Most models assume capital flows are endogenous to the business cycle, and that inflows increase during an economy’s ‘boom’ periods. This column shows that the international no-arbitrage condition in fact does not hold, and that capital flows are pushed into an economy due to high global risk appetite. Controlling for domestic monetary policy responses to capital flows and changes in the exchange rate, exogenous capital inflows lower real borrowing costs and fuel credit expansion. Do capital inflows have any impact on domestic credit expansion due to lower real borrowing costs? We know that capital flow cycles and business cycles go hand-in-hand in emerging markets – so-called boom-bust cycles (Reinhart and Rogoff 2009, Eichengreen et al. 2017). Most standard models assume that the international no-arbitrage condition (uncovered interest rate parity, or UIP) holds and capital flows are endogenous to the business cycle – they flow to the domestic economy when the country is experiencing a boom, and leave when the country is in a recession. In a new paper, we show that UIP fails and exogenous capital flows are pushed into emerging economies due to high global risk appetite, and fuel a credit expansion by reducing the real cost of borrowing (Baskaya et al. 2017). When UIP does not hold, domestic interest rates are a function of country risk. When global risk is low, investors are more willing to tolerate the higher country risk associated with investing in emerging markets – a perception that is equivalent to an exogenous fall in country risk. As a result, capital flows into the domestic economy independent of domestic economic fundamentals, and leads to a reduction in local banks’ funding costs. These banks then pass on the lower rates to firms and local credit expands. We show that over 2003-2013, 43% of actual corporate cyclical credit growth in Turkey, a typical emerging market economy, can be attributed to this channel. To arrive at this number, we begin by isolating the supply-driven component of capital inflows. We do this by first noting that supply-driven inflows expand loan volumes and lower borrowing rates. Meanwhile, when inflows are demand driven, loan volumes still increase, but now borrowing rates rise. Since demand and supply factors have opposite effects on borrowing rates, a simple OLS regression of domestic real and nominal borrowing costs on capital inflows will bias the estimated relationship between the two variables towards zero. We overcome this identification problem by using the VIX index to instrument capital flows.1 Since the VIX is a proxy for global risk appetite, it will isolate the push factor-driven exogenous capital inflows. Moreover, because Turkey is a small open economy, movements in the VIX are exogenous to domestic fundamentals. We combine VIX and capital inflows data with a unique administrative dataset from the Turkish Banking Regulation and Supervision Agency (BRSA), which contains monthly records for the universe of corporate loans that banks granted between 2003 to 2013. Besides the firm and bank identifier, the dataset contains information on principal outstanding, interest rates, maturity, collateral, and the currency denomination of every loan. We match these loan records further with bank and firm balance sheet information, as well macroeconomic variables in the central bank’s reaction function such as the exchange rate and inflation, and include these as further controls in our regressions. Our identification strategy highlights the quantitative importance of isolating supply-driven capital flows. Specifically, an increase in capital inflows that is equivalent to its interquartile range over the sample period reduces real borrowing costs by 1% on average according to the IV estimates (i.e. due to VIX-driven capital inflows) as opposed to 0.37% according to the OLS estimates. To visualise the strong relationship between movements in the VIX and domestic borrowing costs, Figure 1 plots time-fixed effects extracted from nominal and real borrowing costs using loan-level regressions, which control for loan characteristics, such as loan maturity, currency, risk, sector, and so forth. The figure also plots the log of the VIX index and shades the quantitative easing (QE) period (i.e. periods of unconventional monetary policy in the US).2 As can be clearly seen, during the QE period, as the VIX declined, so did borrowing costs in Turkey. Next, we exploit the heterogeneity of our dataset to show that banks with higher non-core funding drive our main effects. These banks have non-core liabilities to total liabilities ratios that are larger than the typical bank, and are thus more reliant on wholesale funding from international capital markets opposed to traditional funding, such as domestic deposits. We find that these banks offer lower rates to all firms, and even lower rates to firms with low net worth, which are in general categorised as ‘risky’ firms. In other words, high non-core banks that face lower funding costs from international markets during low VIX periods pass through these rates to the domestic economy via lowering domestic borrowing costs, and relatively more so for low net-worth firms than for high net-worth ones. However, we do not find that these banks supply relatively more loans to low net-worth firms. 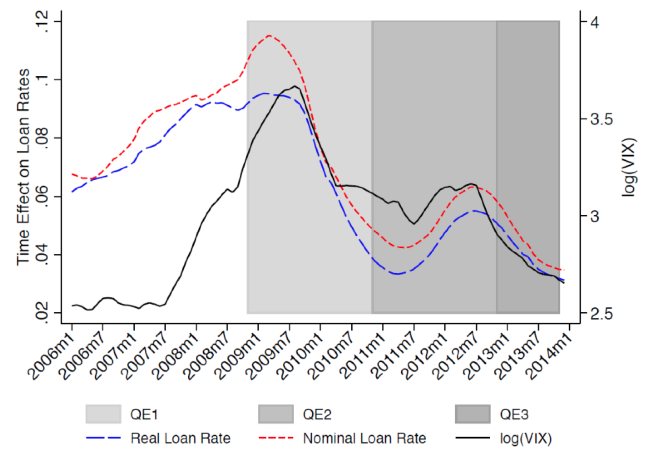 To understand why this is the case, we next turn to loan-level regressions. These regressions show a strong positive relationship between loan amounts and the collateral/principal ratio posted for a given loan regardless of firm- and bank-level characteristics, implying that firms face loan-level collateral constraints. These results show the importance of alternative margins of adjustment by heterogonous lenders and borrowers to cheap finance, namely, the interest rate and collateral. It is possible to finance borrowing at a lower rate, while being collateral constrained, where firms can borrow only some fraction of their capital stock and this fraction may not change despite the lower real rates. The standard models of financial frictions cannot explain this channel. In the standard Gertler-Kiyotaki-type closed economy models with financial frictions, lower interest rates arising from expansionary monetary policy lead to credit expansion because borrowers experience positive net-worth shocks to their balance sheets. Our channel is distinct since borrowing expands without a relaxation in the collateral requirement, as a result of lower interest rates, as we show in the data.3 Our emphasis on bank heterogeneity is similar to models such as Bruno and Shin (2015) and Coimbra and Rey (2017), who emphasise the key role of heterogeneity in financial intermediation. Our results link this heterogeneity to international capital flows via the heterogeneity in funding costs of domestic banks. Our results highlight important lessons for policymakers. In the light of the ongoing debate on the optimal monetary policies for emerging markets in an era of push-factor driven capital flows, our results highlight the importance of how much a given monetary policy can (or cannot) do. Controlling for domestic monetary policy response to capital flows and the changes in the exchange rate, we still find that exogenous capital inflows lower real borrowing costs and fuel credit expansion. Monetary authorities may not want to increase interest rates, since this will attract more capital flows, fuelling further the credit expansion and leading to a loss in international competitiveness via the appreciation of the currency (Mishra and Rajan 2016). In such a scenario, most emerging market central bankers might choose a second-best policy such as capital flow management policies. Our results are silent on such normative implications, but on the positive side, they suggest a sizeable effect of global-risk-driven capital inflows on local borrowing costs on the corporate sector’s credit growth. Baskaya, Y S, J di Giovanni, S Kalemli-Ozcan, M Fatih Ulu (2016), “International Spillovers and Local Credit Cycles”, CEPR Discussion Paper no. 11839. Bruno, V, and H S Shin (2015), “Capital flows and the risk-taking channel of monetary policy”, Journal of Monetary Economics 71, 119-132. Coimbra, N, and H Rey (2017), “Financial Cycles with Heterogeneous Intermediaries”, NBER Working Paper No. 23245. Eichengreen, B, P Gupta, and O Masetti (2017), “On the fickleness of capital flows”, VoxEU.org. Gopinath, G, S Kalemli-Ozcan, L Karabarbounis, and C Villegas-Sanchez (2017), “Capital Allocation and Productivity in South Europe”, Quarterly Journal of Economics, forthcoming. Mishra, P, and R Rajan (2016), “Rules of the Monetary Game”, Reserve Bank of India Working Paper, March. Obstfeld, M (2015), “Trilemmas and tradeoffs: living with financial globalization”, BIS Working Papers no. 480. Reinhart, C, and K Rogoff (2009), This Time is Different: Eight Centuries of Financial Folly, Princeton. Rey, H (2013) “Dilemma not Trilemma: The global financial cycle and monetary policy independence”, paper presented at the Jackson Hole Symposium, August 2013. This is a measure of uncertainty and market risk aversion of the Chicago Board Options Exchange. Rey (2013) shows the direct link between expansionary U.S. monetary policy and low VIX. See also Gopinath et al. (2017) for a similar mechanism.